Puerto Rico is a self-governing commonwealth of the United States. It is located in the Caribbean Sea, east of the Dominican Republic. Just like all Caribbean islands, Puerto Rico is a tropical paradise that welcomes tourists with unbelievably beautiful beaches and plenty of activities to engage in. As you can imagine, you can go scuba-diving and snorkeling, but you can enjoy water sports as well. If you are a golf enthusiast, you will find the facility for it. Plus, you can gamble at one of the casinos. However, nothing beats seeing bioluminescent lights. The best place to experience is in the bay in La Parguera. Just make sure that it is a new moon. Renting a kayak will provide a better view. You should not miss it for the world. Before you travel to Puerto Rico, you need to see whether or not you need a visa to access the islands. The visa policy of Puerto Rico is the same as for the United States, so things are pretty clear. First of all, five countries are given general visa exemption, which means that their citizens can enter Puerto Rico without a visa and without any kind of pre-approval. At the same time, 38 countries are visa-exempt as a part of the visa waiver program. 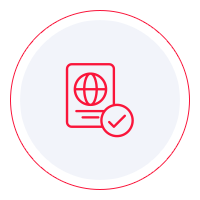 Nevertheless, the 38 nationalities are required to obtain an ESTA before departure, and they can stay on US soil for up to 90 days. All the other nationalities are required to get a visa at the nearest US embassy. To see if you are visa exempt or not, you can check out the visa policy of the US. However, we think that using iVisa’s Visa Checker will make things easier for you. All you have to do is access the feature which can be seen in the top right corner of this page. You need to select your country of origin from the drag-down menu on the left and choose Puerto Rico as your destination on the right. The result will tell you whether or not you need a visa to enter Puerto Rico, and if you require a visa, you will be provided with a list of the nearest embassies where you can apply. Unfortunately, iVisa cannot help you obtain your visa for Puerto Rico, but we still want to be of some kind of assistance. That is why our support service is at your disposal 24/7, and it is entirely free of charge. The next thing you need to get out of your way is the visa requirements. You need to know what they are so that you can meet them. While there is a ton of information online, we advise you to use it as a reference only. That is because online information is not always the most reliable. In consequence, we recommend that if you need a visa, you should call the issuing authority in advance and ask them about the requirements. They can give you the most reliable information available. In the meantime, what we can tell you is that all travelers that wish to go to Puerto Rico need a passport that remains valid for at least another 6 months from the date of arrival in Puerto Rico. We regret that we cannot help you any further, and we hope that the information above is useful.